Hey everyone! I've been using a new cleanser for my face recently and I have been loving it! 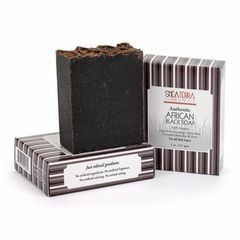 It's the Sheaterra Organics African Black Soap. I received a sample of the soap from the company when I purchased their argan oil. For those who are looking for an all natural cleanser I suggest you try this because it's USDA certified organic. Also this is authentic black soap as there are no dyes added to the product. On the company's website it is suggested that after applying the product on your face you leave on for five minutes. I usually use this in the shower and will leave this on while I wash my body and shave. I'm loving the results that it has given me so far and it hasn't caused any reactions on my skin. My skin feels really smooth and clean when I use this. Also I have noticed that it has helped clear some of my blackheads so I'm hoping with prolonged use I'll be able to finally get rid of my blackheads. The sample that I received is hardly finished yet and have been using this soap for over a week. I will be repurchasing the full size soap after my sample finishes. The full size soap retails for $8 and its 4.5 oz. I've been looking at other products for Sheaterra and I'm looking forward to trying more products from this company. I'm really happy that the majority of their products are all natural and there are no harsh chemicals in them. Loving this soap! Recommend you try it!